My dad and brother-in-law have birthdays a day apart. They are both handy guys and I was inspired by a pun I came across on Pinterest. 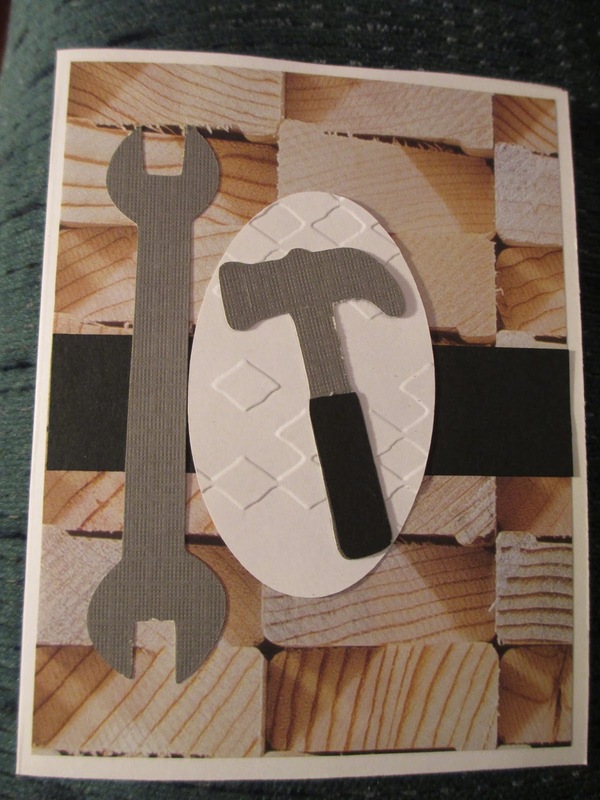 The wrench is from the Cricut Indie Art cartridge and the hammer is from Everyday Paper Dolls. It was not a layered image, so I cut out one in black and one in gray, cut the top off the black one and glued it on the gray one. The oval is from Cricut Font and Basic Shapes. I ran it through the Cuttlebug Diamonds in the Rough folder. 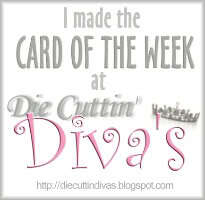 This card will be entered in sketch challenge #251 at Die Cuttin' Divas. Hope your day is purrfect! My friend's little girl is turning 8. Knowing that they have several cats, I decided to go with that for making a card. I used the cat and the word "purrfect" from Create a Critter. The other words were printed from my computer. The turquoise background was run through the Happy Birthday Cuttlebug folder. I am getting her a package of embroidery floss for making friendship bracelets and a box to put the floss in. I decided to use vinyl to put her name on the lid. I used the Cindy Loo cartridge for that. 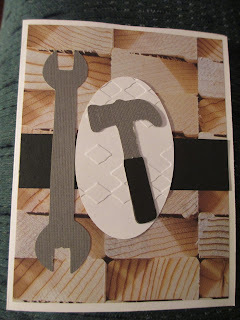 This card and project will be entered in the Anything Goes challenge at the Fantabulous Cricut Challenge Blog. My niece is getting married next weekend and Tiffany blue is her wedding color, so I tried to match the color of the card as closely as I could. I am including a recipe card in the envelope because I was unable to make it to her shower, so I had to use a larger envelope. Because of this, I had a little space next to the Cuttlebug (Scrollwork) design, so I decided to run a piece of ribbon down the side. The sentiment was a freebie from Paper Crafts Mag. I printed it and cut around it using my Creative Memories Custom Cutting System. The idea for this card came from this pin I came across on Pinterest. The sketch came from Die Cuttin' Divas. The cow die cut is from the Create a Critter cartridge and the background was run through the Juli's Garden Cuttlebug folder. I needed to whip up three boy birthday cards this morning, and these Lego cards were quick and easy. I just cut out three 1.25 inch circles and put them on foam tape. Graphically Speaking is my go-to cartridge for circles. The sentiment inside reads "I hope 'Everything is Awesome' on your birthday!" I also made a green one, not pictured. These cards will be entered in the kid themed challenge at Die Cuttin' Divas. 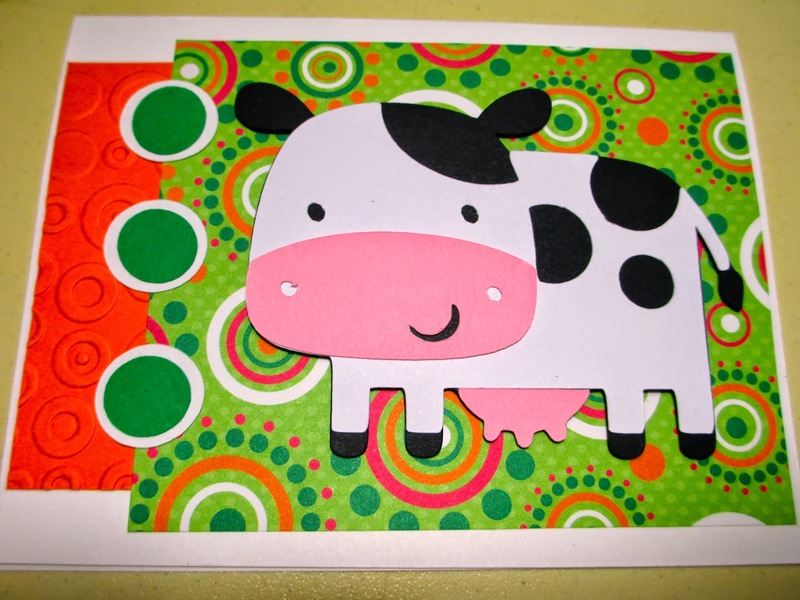 Here is another cow birthday card, in keeping with the tradition I have with my best friend. I came across the pun on Pinterest. The cow is from Create a Critter. The orange piece on the left was run through the Spots and Dots Cuttlebug folder. I came across this saying recently and knew it would be perfect for my dad! It was the inspiration for this Father's Day card. The mug of beer is from Smiley Cards. I ran the foam through the D'Vine Swirls Cuttlebug folder. The sentiment was printed from my computer. Craft Junkie Too ~ A Place for all Things Crafty! Simply Crafty Creations by Sandy S.